With global warming, the animals in the Arctic are coming under threat. The polar bear is one of the first species to be affected as it relies on the winter ice pack to create good conditions for hunting seals. This little polar bear, Churchill, although fun to sew as a first bear project, is a good way to remind us all to reduce our impact on the earth wherever possible so that we don't cause harm to the creatures which share it with us. This little bear requires patience to create. It is made using two basic sewing stitches (the ladder stitch and the back stitch) and requires a five to six-inch square piece of good quality white felt or thin imitation suede fabric for each bear. If this is your first attempt at making a bear, work slowly and carefully, make tiny stitches, and be patient. Your first bear may not resemble the one in the photo. Every bear develops its own personality as it is made. Keep trying and you will soon be making these little bears with no trouble at all. Note: These toys have very small parts and are not suitable for young children. To make Churchill the bear you will need. A five to six-inch piece of white felt. For this project, you need sewing quality rather than the thinner craft quality felt. Many fabric or quilting suppliers carry this. You can also substitute white mini bear fabric from the online bear craft suppliers, or use a scrap of lightweight imitation suede. A small amount of quilt stuffing, cotton batting, or wool roving for stuffing. Haemostats or fine blunt-ended tweezers to turn the bear parts right side out. Two small black beads these are used for eyes. Black embroidery thread for the bear's nose. White quilting thread or another strong thread to joint the bear's arms and legs. Computer printer and paper to print out the pattern for Churchill the bear. Cut out the fabric parts for your miniature polar bear according to the pdf (acrobat reader required) pattern for Churchill the Bear. The pattern contains a 1/8 inch seam allowance so you should cut carefully along the pattern lines. Fold the arm and leg sections in half (right sides of the fabric together if you are not using felt) and stitch the seams close to the edge of the fabric using the back stitch. Stitch from A to B leaving the top of the legs and arms open. Now stitch the main body together. Stitch the two body fronts, right sides of the fabric together (the inside facing out as you work on it) Stitch from the bottom of the front under the tummy, at C, up to the point on the forehead marked D. Now unfold the body fronts which you have sewn together, and match the back of the body to the sides of the front so that E's and D line up. Sew up from E to D along the sides of the back and the front, using the backstitch. Make sure you leave the bears body open at the bottom edge. Sew from D to E down the other side front and the back, making sure the edges match. You should now have a body with the two fronts and the back joined together. Use Hemostats or tweezers to turn the small parts right side out, making sure not to stretch or poke holes in the felt. For this step (turning is the most difficult part of making little bears) take your time and use the hemostats to turn over tiny bits of the fabric at the top of the tube a tiny bit at a time. Slow but steady works best! When you have the parts turned right side out, gather a small amount of stuffing material in between the tips of your haemostats or tweezers, and start stuffing the nose section of your bear. Stuff it firmly, but not rock hard. Continue to add small amounts of stuffing, completing the head and working down the body. When you have completely stuffed the body, sew the opening closed using the ladder stitch. Stuff the arms and legs in the same way, and close the openings using the ladder stitch. Now you are ready to joint your miniature polar bear so that the arms and legs will move. Thread a 2-inch long needle with strong thread and knot the end securely. Push the needle through from one side at the position where the leg will be. On the opposite side of the body from the knot, run the needle through the top of the leg (make sure you have the toes pointing forward!). Turn the needle and go back through the leg and the body to get back to the knot on the other side of the body, pulling the thread fairly tightly. Now thread the second leg (toes forward!) onto the needle and match it to the position of the other leg. Push the needle back through this second leg until it comes out through the top of the first leg again. You may need to use a thimble to protect your finger from the end of the needle while you push it through. Go back and forth between the two legs a few times until you are happy with how firmly the legs are attached to the body. When you are happy with the legs, take the needle and thread diagonally up through and across the body to get to the arm position on the opposite side and thread on a (paw forward). Sew on the arms through the body the same way you did the legs. Finish by bringing the thread out at the back of the bear's neck and making a few stitches then pull the needle through the bear's body and pull it tightly, while you cut the thread close to the body. When you release the thread it should pop back inside the body where you won't see it. To complete your miniature polar bear, position his ears along the seam between the back and the two front body sections. Sewing from the front of the ears, attach the base of the ears onto the head, curving the ears a little as you sew. Run a second line of stitches at the base of the ear from the back. Use a piece of black embroidery thread (two strands) to sew a bead in place for an eye on one side of his nose. Or make large French knots instead of using beads. Pull the thread tightly to the other side of his nose to attach the second bead. Pulling the thread tightly will set the beads slightly back into Churchill's head. To make a nose for your bear, use an embroidery satin stitch to make a small rectangular bar, heart shape, or upside down triangle at the end of his nose. Take a short straight stitch down from the end of his nose and sew an upside-down V for his mouth on either side of the straight stitch. 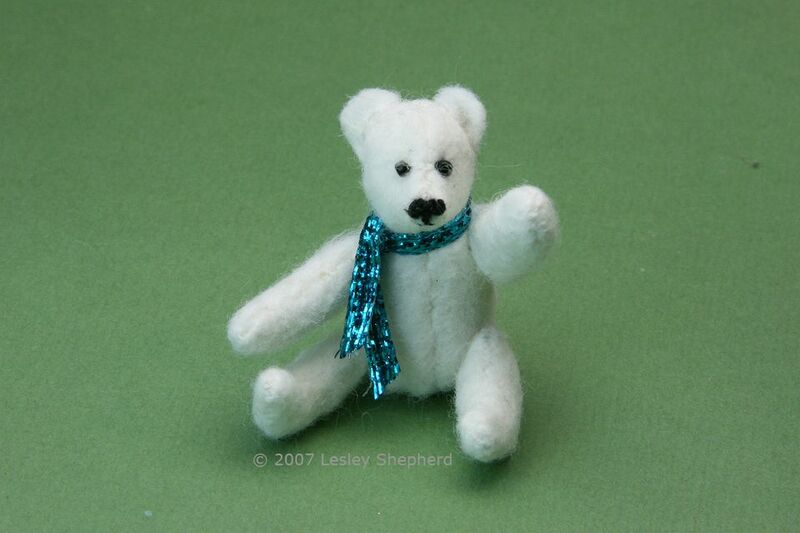 (see the sample in the finished photo, or look at the gallery of miniature bears from Josephine Parnell for ideas! Every bear will develop his own personality. Enjoy yours, and remind whoever he lives with that real polar bears need cold Arctic winters in order to survive!